Free Speaker slots - If running a seminar is not for you then why not take one of our after lunch speaker slots? A great way to promote your Business to up to 80 people per lunch. Members only evening events - Cannot make the lunch time event? Then there is a great chance to cath up with friends and newer members at our popular members only events in the early evening. Free Access To The National List Of Members - with 24 groups spread across the UK there are over 2000 busines contacts you can potentially connect with. 5% cap on any specific category - Unlike BNI we belive there is always room for choice in our group. At the same time we know our members enjoy the diversity of the people they can connect with at every meeting. It also means that we operate a strict 5% policy on member growth - which means in a 100 member group you will never see more than 5 members per category. Diversity rules! New visitors each month - We work hard in the background to encourage the contacts you want to meet to come and join us for lunch. Our sophisticated table seating planning software then makes the introductions happen - like magic. Promote your Business and events through the blog - dedicated to the Chester area our blog is a valuable resource for members to promote their Business, share their knowledge and tell the world about their successes. Linked in group - with online networking playing a bigger part in all our lives we also provide a members only group for Chester members. "The Business Network Chester is by far and away the best business networking group I have ever been part of and it's entirely down to the energy that Tracy and Hayley put into it. It is a pleasure to come to every event; I always come away with either a lead or a useful piece of information and think you do a superb job of running the show. Congratulations to you both!" "Why consider Business Network? Well Tracy and Hayley are great. They go out of their way to know everyone and to help them. 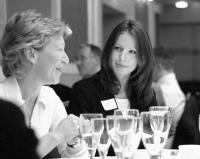 The total focus is on helping to introduce you to the right people in a very informal manner. There are no pressures, just simply getting to know like minded people in a nice environment and the outcome is that you make friends with people you can help or they can help you. I love it !! "